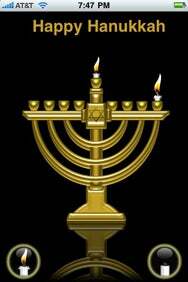 Hanukkah is as fun to celebrate as it is difficult to spell. This year, why not incorporate your iPhone into your enjoyment of the Festival of Lights? When you note how many Hanukkah-themed apps are in the App Store, you might think it’s a miracle. I’m only reviewing six apps here, but with luck a few of them will be fun enough to stretch for all eight nights....These are all fine if not spectacular apps for celebrating Hanukkah iPhone-style. If you’re looking to get your iPhone into the Jewish holiday spirit, Dreidel, Dreidel, Dreidel and Super Dreidel slightly edge out their competition, and the menorah apps are really a matter of personal preference. Happy Hanukkah, and happy tapping!